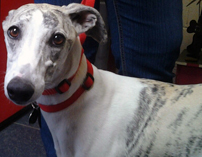 AGR welcomes Poppy the Whippet, aka Sugar Pop. He was surrendered to us by his owner. He is 18 months old, knows basic commands, and uses a doggie door. He is Valley Fever positive but asymtomatic. Poppy is very sweet and has LOTS of energy! He is NOT good with cats but he is okay with dogs smaller than him. UPDATE FROM HIS FOSTER MOM: Poppy loves toys, including his ball and frisbee - he plays fetch. He needs AM and PM walks but needs a little training to heel. He wants 3 meals a day and is definitely still a puppy. He likes his crate and doesn't bark much, except at the store. He hasn't been around children much, but he seemed fine with the ones he saw briefly... he's not shy, anyway. Poppy would love a dog his size to play with and would love to come and live with YOU!